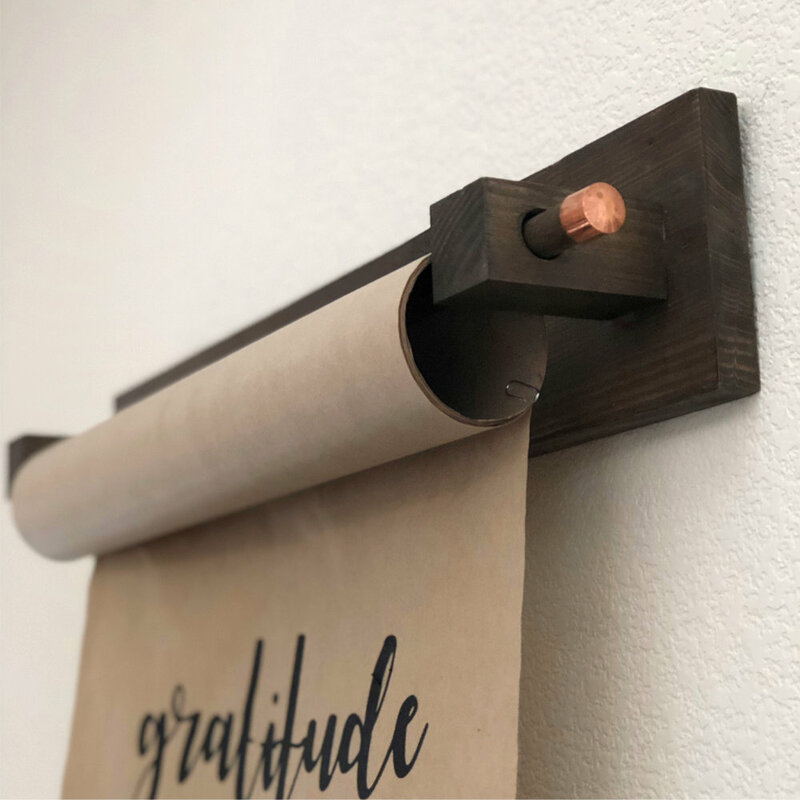 Below, I’ll share all the details for how I made a custom scroll with my favorite quote as well as the scroll holder at a fraction of the cost of the boutique one. With all the boards and dowel cut to length, I drilled a 3/4” hole into each of the 2x2” pieces. To get the look of stain, I always use BB Frösch because it is waaaay faster and easier than traditional stain, it isn’t smelly like stain, and I can use ANY color I want. For the look of traditional brown stain, my go-to is Benjamin Moore “mink” mixed with BB Frösch. For a full faux stain tutorial, click here. Once the dowel and all the cut wood pieces were faux stained, and dark waxed, I glued the 2x2” blocks onto the 24” board about 1” in from the end and evenly spaced from top to bottom. Gluing was a BAD IDEA because the pieces popped right off. So, I ended up nailing them on. Next time, I’ll screw them on from the back. The dowel slid nicely through the holes, and the copper caps fit snuggly on the ends of the dowel. For the quote, I used my Silhouette to cut heat transfer vinyl inspired by my favorite sign from Details2Enjoy. I just ironed it on with my household iron! 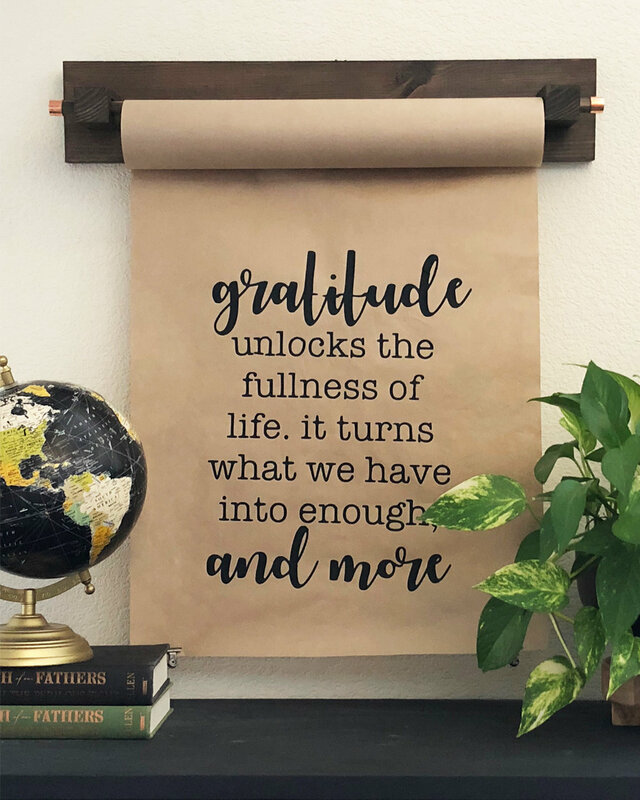 If you don’t want to use heat transfer vinyl, you could use a stencil and paint a saying or hand letter your favorite quote onto your paper. The nice thing is, you’ll have plenty of paper to start over if you screw up! If your paper wants to stay rolled, just secure a hinge clip or two to the bottom to weigh it down. When you get bored, roll the paper out, tear off your sign, and make a new one!